According to Google Trends (see graph below), one of the hot trends in American business today is invoice factoring. You see it online; even hear about it on television and the radio. But would it surprise you to learn that this way of creating cash flow for your business isn’t new? In fact, invoice factoring is over 2,000 years old! In today’s world, invoice factoring is the process of selling a particular asset, in this case your accounts receivable, to an outside “factoring company” for less than what it’s worth in exchange for cash right away. Traditional invoicing to customers can be a lengthy process, but when you use a factoring company, you may get cash for your accounts receivable in 10 days or less. The very word “factor” comes to us from the ancient Romans. It means “he who gets things done.” And that is a very apt description – both then and now – for invoice factoring. Ancient Phoenician sailing merchants used factoring to fund their ventures from 1,500 to 1,300 B.C. Roman farmers used factoring from 31 B.C. to 476 A.D. to keep the family farm going during seasons when previous crops failed. Great Britain’s East India and Hudson Bay companies used factoring to finance the growth of their businesses in the 1500s right through the 1800s. The Pilgrims on the Mayflower funded their voyage to the New World with the use of factoring. So did the colonists who established the Massachusetts Bay Colony. Early American businesses and industries often used factoring to provide cash flow as they grew. Factoring provided capital for innovation, payrolls, materials, and so much more. 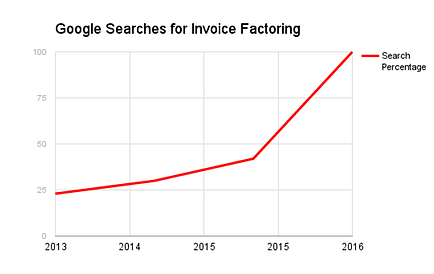 There is a huge spike in Google searches for invoice factoring. Why is that? Traditional loans to businesses from banks remain competitive and interest rates vary depending upon many factors including creditworthiness of the applicant. Some Invoice factoring companies will process the billing for their clients, freeing up vital human resources. Given the challenging lending environment with traditional banks, many companies turn to the advantages offered by this form of alternative finance. Big or small, businesses benefit from invoice factoring’s speed and flexibility. In every industry. Just ask any ancient sea merchant! At Bay View Funding, we’ve helped businesses just like yours to understand invoice factoring as a useful tool for success. We aren’t two millennia old, but we’ve helped plenty of customers since 1985. Our veteran team of factoring professionals is standing by to help you get the answers you need. Contact us here or call (888) 229-9993.